Always good to have those in your vicinity.. These folks post lots of good stuff on subjects we're interested in. If you put keywords into the search box you can spend hours looking over the results. Enjoy! Are you in the process of seeking a good means of obtaining a basic understanding of survival principles and practices? If so perhaps I can lead you into the right direction. Two initial things we must first concern ourselves with here are first finding a good book relating to survival and secondly discovering a means of practicing these various scenarios. There are a vast number of excellent books on the topic of survival ranging from Stroud’s "Survive!" to Wiseman’s "SAS Survival Handbook " however in the interest of cost reduction you might wish to consider the Army Survival Manual. This book is readily available in digital format and can be downloaded onto your computer. Army FM 21-76 was created by the US Army to train the soldiers in being able to survive under adverse conditions. Although being a dated book the information contained in the 1992 version is just as useable today as it was back in the year it was created. If you are lucky you can find the newer 1999 version however little changes have actually taken place between the two manuals. In some cases you might perhaps chance upon the FM 3-05.70 version. If you do see that version you would be wise to grab it quickly as that is the most updated manual yet. It features the militaries new numbering system as well. In FM 21-76 you will encounter several major topics of interest. The manual starts out with some survival psychology and quickly leads into the planning and creation of various types of survival kits. Additional chapters include survival medicine, shelter basics, how to find water, starting fires and food procurement. Several chapters explain plants as used in your survival environment along with those plants and animals which are hazardous to human life. Quick and immediate weapon construction can be found in later chapters while there are individual sections dedicated to survival under extreme conditions such as desert conditions, tropical climates, cold weather or surviving at sea. The book ends with information relating to direction finding and signaling techniques. As you can see it supplies the new comer with a complete course in survival. No assumptions are taken that you already know something of the fundaments and all aspects are clearly explained. This is a perfect reference book to keep in your bug out kit or in the glove box of your bug out vehicle. On the other requirement listed above, there simply is no quick and dirty way to learn the information other than to get out with the books above and try what it teaches you. It may possibly be easer to learn by being taught the information but it certain is not by any means impossible to learn it by your self. I find the information is better embedded into my mind if I have to work it without the benefit of an instructor. Good luck. I love pocket-sized survival kits. 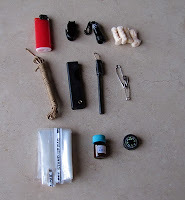 For EDC situations, I prefer an easy-to-carry wallet kit, but for a wilderness survival situation, a more full-blown kit is in order. Enter the altoid survival kit. 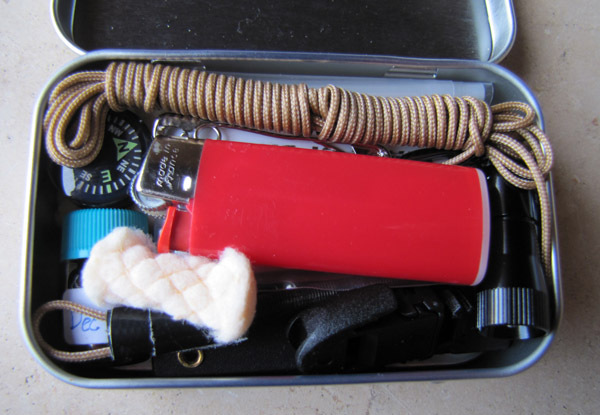 Who knows what genius initially came up with the idea of using an Altoid tin to hold a survival kit, but survivalists everywhere owe him a debt of gratitude. I'm a mildly obsessive sort, always interested in improving things in whatever that I can...so these kind of kits are right up my alley. Sourcing miniature survival gear and putting together a decent kit is waaay more fun than it should be. As I've mentioned previously, I'm in a gift exchange this Christmas. There's a price limit of around $20, and I wanted to see what kind of Altoid survival kit I could pull together for that amount. I started by listing out various survival priorities. For each category, I needed to find an inexpensive, altoid kit-sized piece of gear. An interesting challenge indeed. Four pieces of TinderQuik tinder. Cost: I had this lying around doing nothing, so it was free in that sense. If I hadn't had this kicking around, I would have used a folding razor, which is $1.50, and a piece of hacksaw blade, which is basically free. I'm looking to wedge some gorilla tape into the kit somehow, but overall I'm pretty happy with how it turned out. The Emergency Water Bag and miniature vial of purification tabs is the best water set-up that I've seen in a PSK-size, and the Nano Light is a great piece of kit. For the cost, this is a pretty darned good set up. The kit obviously comes up a bit short on shelter/covering, but all pocket kits do. There's just no room for a poncho, spaceblanket or similar in an altoid tin. This kit does have some good cordage, though, which will help when fashioning a debris shelter. Food gathering is a bit short as well, though with the folding razor, saw blade, and cordage you would be able to improvise traps, gigs and so on. If I was going to spend a bit more on this kit, the first thing--and probably the only thing, really--that I would upgrade would be the knife. The folding razors are ok and inexpensive, but I'd rather a mini fixed blade like the RSK MK5 or a small lock back like the Spyderco Ladybug . There's not much space for anything additional, save maybe some small nails, fishhooks and maybe some tin foil folded very flat. And there's not much in the current kit that I would want to lose...either the lighter or the ferro rod could go (they're redundant), but that's about it. Anyways, there's the kit. Fun, affordable little survival project to pull together, and I will be sad to see it go at the gift exchange! Hopefully I get something just as good in return...which is highly doubtful! Usually most of us are accustomed to jumping in the family car and visiting one of our local stores in order to obtain items for our various needs. In general, most of the minor items which are needed for our day to day survival are fairly inexpensive to replace when wore out or damaged. This is assumed that we are discussing normal circumstances here. Our normal process is to replace items as necessary however there will likely come a time when this practice simply will not work. Perhaps there will not be a store to purchase them from or maybe we simply can not find any of the necessary items anywhere. What will that mean to us as survivalists? It means we will need to improvise whenever we can. An excellent way to practice this concept is to take one item and brainstorm to see how many other uses you can put that item too. Look around you and carefully observe all the natural things that appear to you. Ask yourself what can you use these items for? Once again create multiple uses for anything you can. The good news is that in order to increase your chances at surviving your predicament you can let your imagination run wild, add a little creativity and in the end you should be able to devise your own basic survival necessities. The process of improvising in an emergency is going to be one of your foremost needs. By the process of improvising you or your group will be able to make many of the needed pieces of equipment that may be required for your survival and wellbeing. One’s military training often provides them with logical steps which should help anyone that needs to quickly improvise under emergency conditions. Your first step should be to determine exactly what it is that you need. When making this determination be as specific as you can. Now that you have some idea as to what you need to improvise take stock of your supplies and the various materials you have on hand. Follow this up with a compiled list of options which you have at you disposal. Pick one of the options that you have reviewed and base your decision on sound judgment. Consider only those which are based upon making the most from your available time, the energy that you have and the use of the materials at hand. Finally, proceed with your established plan and once your project is completed ensure it meet your needs. There you have it in a brief and concise manner how you should attempt to accomplish your improvising task when confronted with the lack of necessary supplies and equipment. Get into the habit of watching all around you and thinking of how things you see can be best put to use. Just when I had it up and running, I had to switch routers and now I'm having some issues setting up the port forwarding for the FTP. I'll post if/when I get this resolved. Christmas, Hanukkah and Kwanzaa season is here (thanks to those supporting SHTF Blog by using the Amazon search bar for shopping) and if you’re a SHTF Blog reader not finding joy in the season, it might be a sign you’re on the verge of prepper burnout. Prepper Burnout (noun) – the act or process of exhausting mental, physical or emotional energy through intense focus and preparation on/for a collapse in social order, natural disasters, pandemics, economic troubles or other problems that could put an individual’s life or livelihood in danger. It can happen to the best of us, and anyone following this site from the beginning knows that it happened to me. After updating the site 7 days a week for nearly a year and a half, I found my outlook on the world was changing. I began to see daily life through a TEOTWAWKI lense as I searched for post material and signs The End was upon us. Prepping consumed me and I burned out, sold the site off, took a very long break until I eventually recovered and bought SHTF Blog back, ready to enter the prepper world again in hopes of leading you all toward apocalyptic preparations. I learned from that experience and now have a healthy balance between preparing for difficult times and enjoying daily life. The two can coexist for the more veteran prepper, but many newcomers are susceptible to prepper burnout. Take Melinda for example, who used to author Prepper’s Home Journal, a blog on prepping. She brought Chad Person’s Underground Bunker to my attention. Want to see her site? It’s gone. The last post I read from her she was asking readers for advice about how to combat prepper burnout. It’s safe to assume the Melinda’s blog treated her the same way SHTF Blog treated me, an intense focus on prepping that corrupts your daily thinking. Melinda was a victim of prepper burnout. Are YOU on the road to prepper burnout? Only read news articles that cover bad, negative or pessimistic material and you ignore counter arguments that pose a more encouraging outlook. Don’t see the beauty and pleasure in daily life, because your thinking is focused on The End. Spend your spare money on securing preparedness goods and spend budget nothing for personal entertainment. Visiting preparedness websites on a daily basis puts you in a sour mood. Prepping is important – don’t burnout! Recognize that people have been preparing for the end of time since the beginning of time. While doomsday could strike tomorrow, it’s quite unlikely. View prepping as a hobby. This has worked well for me since my burnout. Everyone needs a hobby. I could collect stamps, baseball cards, become a television junkie, play video games non-stop OR I could prepare for uncertain times through skills building, gardening, reducing energy needs, etc. Prepping is a practical, worthy hobby. Since seeing prepping as a hobby with real world benefits, I decided to update SHTF Blog 5 times a week, not 7, and I sought the help of Jarhead Survivor so the full weight doesn’t land on my shoulders. Find a healthy balance. Prepare for social collapse and social order at the same time. It is wise to spend money on food and water storage in case catastrophe strikes and it is also wise to put money aside for retirement in case it does not. Focus initial gear and food purchases on those that have use now, not just under times of trouble. By this I mean, buy items that have a dual purpose, things that you can use now. Nothing is more disheartening than spending a ton of money on an item that only sits on your SHTF shelf waiting for the day it will be needed. You begin to think, “Why did I do that?” If you can use the item now, you’ll find the purchase worthwhile. The same goes with food. Buy foods you eat daily to start, build a backup supply of those foods. You KNOW you’ll eat them, just rotate stock. Add items like freeze dried foods later. Take a break. Focus on something else for a while until you have the energy and interest to return. These are just a few suggestions. Have you suffered prepper burnout and come back again? If so, what worked for you? Grommets seem to show up in all sorts of outdoor and survival gear, from tarps and tents to truck tie-downs. They’re handy when they work, but all too often they tear out of the fabric. Many people will just sigh and replace the entire item, or hope it will hold for just one more camping trip. But if you catch these little buggers in time, you can repair them as good as new. Better than new, actually. The trick is to catch the tear early, before the grommet has ripped through the edge of the fabric. So, it’s wise to check your grommets every time you use your tent or tarp. Look for signs that the fabric is creeping out away from the metal. Here’s how to replace the torn grommet. These techniques work for any fabric using grommets–plastic tarps to canvas tents. Step 1: Remove the old grommet. This can be tricky, you’ll probably need a pair of pliers and maybe some tin snips or bolt cutters. Try not to tear the fabric any more than it already is. Step 2: Assess the damage and repair. If the hole is still intact and hasn’t ripped through the side of the fabric, you can simply replace the old grommet with a new one. In a survival situation, though, you may not have access to any fresh grommets or setting tools. Don’t worry, there are several ways you can improvise. Use 2 layers of thick leather as a replacement grommet. Just sandwich the hole between two layers of leather. Stitch around the leather and punch a hole in the center where the hole belongs. You’ll either need a heavy duty leather sewing machine for this, or a stitching awl, leather needles and heavy thread. Another alternative is to place a metal washer or ring over the hole and hand stitch around it using heavy weight waxed linen or kevlar thread. Beware though, use metal that won’t rust if you’re putting it next to canvas. Rust will rot through canvas over time. Finally, you can simply sew a buttonhole stitch around the entire hole. If you’re working with canvas, this will create a sort of “self-grommet”. It’s very strong and has been used for centuries in corsets and ship sails. So, what do you do if the old grommet ripped through the side of the fabric and the hole is no longer intact? Your best bet is to create a large patch out of canvas or nylon webbing and sew it over the hole. Stitch it down securely, zig-zag back and forth several times. You want the patch to feel like part of the fabric. Then just punch a new hole and either add a fresh grommet or use one of the improvisations listed above. Don’t let a torn grommet ruin your next camping or canoe trip. It’s a simple fix and often your repair will be stronger than the original. Julie Anne Eason is a freelance sewing and craft writer. You can reach her through her website SeriousSewing.com where she writes about Brother sewing machines, sewing cabinets and professional irons like the Miele B990 rotary iron. The easiest method of filtering water is to buy a quality water filter. Most families, staying put during a disaster (bugging in), will be well served by a Katadyn or Berkey water filters. I can recommend the Katadyn Drip Ceradyn water filter or the Big Berkey water filter. Both of these filters are difficult to transport because they are designed for home or camp use. The complete filters are also expensive; you can reduce the cost of a complete filter by just buying the filter elements and constructing a filter out of five-gallon plastic buckets. Now sooner or later, usually later with a Katadyn's Ceradyn and Berkey's black berkey filter elements, you and your family are going to have to construct a water filter out of available material. I have included two links to a "slow sand filter." A slow sand filter uses sand, soil, and rocks in a 55-gallon drum to filter water. Make sure you read and print the slow sand filter plans from Surfer Without Borders. The other links should be read, printed, and placed in your survival bible as you see fit. The course of history hasn’t changed much when it comes to our drinking water supplies. We either get it from standing water, such as a pond or cistern, or we get it from a hole in the ground. One thing that has changed is how we make that hole in the ground. Nowadays we usually hire a well drilling company to do the job, but sometimes the situation calls for an old fashioned hand dug well. One key factor in any well is protecting it from contamination, and hand dug wells are especially prone to problems if you do not take steps to prevent problems from occurring. There are many ways to do that today, from using corrugated culvert to precast concrete caissons to line the well. But to some extent you can also pour in place your own concrete well lining. One of the most necessary appointments of the farm is a well to furnish a supply of good, pure drinking water, and a well should be so located and lined that the water will be protected against all possibility of contamination from outside sources. The old wooden well lining and cover not only permits particles of soil and vegetable matter to drop into the water but soon reaches a state of decay when it becomes a source of danger to life and to limb from contamination and possibility of accidents. The top covering becomes loose, boards are pushed into or dropped down the well and the opening is a serious menace to farm animals and children about the place. A concrete well lining and platform will overcome and for all time prevent these dangers. The concrete well lining should extend down into the well from 6 to 8 feet or sufficient depth to prevent burrowing of animals and seepage through the upper layers of soil. In localities where an underground water stratum of undesirable quality is found at greater depth than this, the lining should be extended down far enough to exclude such water. In lining a well with concrete first remove the top cover as well as the old lining down to the desired depth. At that depth a platform must be built to form a stage on which to work. This platform may rest on the old lining or else be supported against the soil within the well. With this platform in place and all of the old lining thoroughly removed, forms for the new lining may be built. These should consist of 1 by 4 inch strips beveled at the edge to permit their being placed around in a circle with tight joints facing the concrete. One of the accompanying illustrations shows this in the sectional plan of forms. These boards should be braced by 2 by 4′s at sufficient intervals to insure that they will not bulge or give way under the pressure of the fresh concrete. These forms are 4 feet long as shown in the sketch of the vertical section and are so bolted together that they are easily collapsible when necessary to take them down. As a rule only interior forms will be needed if they are braced and blocked sufficient distance from the earth wall when concreting. After the form section has been filled with concrete the forms should be left in place until the concrete has thoroughly hardened. Then they may be removed and a support or platform built for casting the concrete cover slab or if this is not too large to be handled in place by three or four men, it may be cast separately in a form made for that purpose and when it is hardened be moved to its position over the well curb. A platform not less than 4 inches thick and reinforced with 1/4 inch round rods 8 or 10 inches center to center should be made. An opening must be provided for inserting the pump and another one to serve as a manhole which may be necessary if the well has to be cleaned out at some time. A tight fitting concrete cover should be made for this manhole, provision being made for it when the cover slab or platform is cast. The edges of the manhole opening should be beveled and the cover for the manhole opening correspondingly beveled to fit into this opening. Plan of concrete pavement on ground around well lining or curb. Concrete for a well lining platform should be mixed not leaner than 1:2:4 although a 1:2:3 mixture is preferable. The pebbles or broken stones used should not exceed 1 inch in largest dimension. For the new year I don’t like to make resolutions, I like to create goals. Goals are good for people to have because it’s the plan that gets them from Point A to Point B in life. Unfortunately, a lot of people don’t know how to set goals and work towards them, so I’m writing this to give a little advice on how to do so and save you hundreds of your hard earned dollars in self help gurus at the same time. I have personally used these techniques to get out of debt, lose weight, and achieve a stable and happy relationship among others, so I know they work! The first thing you have to do is set a goal. What is it you want to do? Since this is SHTFblog I’ll show you how to set and achieve some real goals that will help you towards survival. With the first statement there are no measurable goals – just some desires that I wrote down. In the second sentence I now have specifics. I know exactly what I want, how much I want, and when I want it by. Now I have something to work for and numbers to plan with. Make your goals achievable. If I said, ”I’m going to have 20,000 cans of food in my pantry by March,” it’s not likely to happen and I’m setting myself up for failure. By making your goals possible to reach you’ll stay motivated to keep moving towards them. Break the goal up into doable chunks. Don’t try to eat the elephant all at once, you’ll choke on it and pretty soon you’ll give up. Here’s a better method. First, figure out how many months between now and your goal date. In this case I’m going from January to July so that’s seven months. Jan, Feb, Mar, Apr, May, Jun, Jul. I get paid every two weeks so I’ll say that I’ve got about 14 pay periods between now and my goal date. Now I take cans wanted and divide 14 into it. For example: If I want 100 cans of Spaghettios I divide 14 into 100 and come up with 7.14… Therefore, I need to buy 7 extra cans of Spaghettios every two weeks when I get paid in order to meet my goal. Now I can see that every time I go shopping I need to have an extra $53.20 with me to achieve my goal. Act on your goal. Once you’ve got your written down you have to execute it. Budget some money out and when you go shopping every two weeks follow your plan and you’ll know exactly what you need to do in order to achieve your goal. Re-evaluate. If something happens midway towards your goal re-evaluate. Electric bill went up and you’ve only got $30 this week? Buy whatever you can and extend your goal date out a little if you have to. Celebrate! You’re making progress right? Persevere! Things happen in life and you might not be able to afford an extra $53 every two weeks (or however you set it up), but don’t give up! Simply buy what you can afford. At least you have a goal and an idea of how to get there. Goals can be changed ya know, but have the discipline to keep moving towards it. Did I mention that sometimes your goals will involve sacrifice? With discipline, hard work, and perseverance you can do anything you set your mind to. This year I want to save money, start a garden, add to my pantry, among other things. I’ll be setting pen to paper soon to iron out the specifics. What are your prepping (or otherwise) goals for this year? Bug-Out Bags; Bug-Out Vehicles; The process of surviving the unexpected is as complicated in preparation as it is in practice. The idea of self-sufficiency demands that one be able to exist without the means of outside assistance- this includes machinery and vehicles. Many an article has been written about bugging out when the SHTF. This philosophy demands that one determines that the situation is beyond hope and initiates the bugout before the masses realize that something is amiss. Naturally the best case scenario would be to leave well before the disaster or collapse occurs. However, most people will not experience this perfect timing scenario and will attempt to bug-out after the proverbial balloon goes up. There is a saying in the Military that no plan will survive the initial contact with the enemy. What that means is that all of our best laid plans will crumble to pieces the minute you introduce reality to the equation. Regardless of how much we plan; how many lists we check; something is bound to go wrong. Even though you PMCS your BOV religiously and regardless of the fact that you've stockpiled enough gasoline to make it to your bug out location and back; something unexpected can and will happen that will leave you stranded and on a completely different course of action than you intended. What would you do if your BOV suddenly failed you and you can no longer use it? Would you be ready to continue, on foot, to your Bug out location? Backpacking is an awesome sport that relies solely on your own two feet to pursue. It does not require a tremendous amount of expertise to prosper. Aside from selecting and packing a lightweight pack the only thing that is required of you is to place one foot in front of the other. However, this sport can be grueling if your not physically prepared for it. Backpacking is not something that you can pick up only when you need. In order to travel effectively you must condition your body, beforehand, to endure. While constructing your evacuation plans I urge you to consider the possibility of losing your vehicle. Mechanical failures, popped tires, and better armed thugs can all eliminate this asset from your supply list. 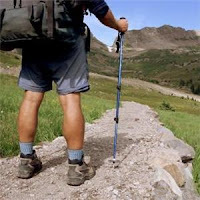 However, if your prepared to backpack, your still mobile as long as your healthy enough to walk. There is an entire industry dedicated to providing hikers with quality, lightweight tools to make the backpacking experience all the more tolerable. Prepping is about planning and I urge you to consider the possibility of winding up, on foot, during an extreme situation. LEDs, batteries and EDC gear. Flashlights are one of those invaluable pieces of gear that those of us that are into survival and preparedness are never caught without. More often that not I’ll have 3 or 4 LED lights with me at all times. My keychain has a nice Fenix LDO1 and I’ll have a 4Sevens Quark Mini123 in my pants pocket. In my bag there’s another AA and 123 light. Its not a big deal. They are small enough and always come in handy. I fid myself loaning one often during shooting classes at night. A few days ago after the shooting class we were going to the classroom and had to walk through a patch of dark field. I brought my flashlight out and noticed it wasn’t nearly as bright as it usually is. Maybe around 50 lumens of output or so, but this light gives 200 lumens on high mode. No problem, I keep spare batteries in my bag which I always have with me. Still, this reminded me that most people don’t carry flashlights on daily basis, let alone spare batteries. LEDs have extended the duration of batteries beyond what people could even dream of a few years ago, but they do run out. Good flashlights like the Quark Mini are regulated, so that means it keeps constant output of power until the battery is almost dead. Good for maintaining constant luminosity, but gives little warning time. This is one of the reasons why redundancy is important, as well as carrying spare batteries. The best way of knowing your LED flashlight is about to die is seeing a reduction in brightness. Even if its still pretty bright, in good LED lights this means it can no longer keep the same lumens out the front and has little time left. In LED lights like the Mini123 that have low-medium-high mode, you know you’re running out of battery when the medium and high mode looks pretty similar. When you can’t notice any difference between low-medium-high the battery should be replaced. One of the few things all gun instructors agree with is that it matters little if you have the best gun in the world or even being the best shot if you don’t have the firearm with you when you need it. Something similar happens with basic survival tools. If you don’t have them with you at all times, you wont have it when you need it. This is why I emphasize so much on the importance of every day carry (EDC) gear. You don’t need anything fancy, but you do need the basics. Which tools area minimum must-haves vary depending on who you ask and the person’s personal experience and background. In my case the following factors come into play. 1) You need to defend yourself from criminals. 2) You need to deal with failing infrastructure. This includes power outages but also sectors of the city, buildings or roads that have no maintenance and lack proper street lighting. 3) You need to be able to perform minor repairs in your vehicle or get yourself out of broken down trains, buses, buildings, etc. Emergency response wont be quick and may sometimes not show up at all. With this premise, the minimum set of tools you should have include: Your gun where legal to carry with one or two spare magazines, wallet, cell phone, folding knife, multitool, flashlight and lighter. These I’ve carried even in jeans with small pockets, Levi 501 type pants. Some of the cargo pants used today have more than enough space for these basic tools and more. The 99$ EDC kit post is a good start for those new to preparedness but that are working with a limited budget. While the basics are in your pockets or directly attached to you. You can (and should) carry a bit extra gear. For women this is called purse :-) for guys it may be a suitcase, backpack, satchel, briefcase or messenger bag. Laptop cases and shoulder bags have become so popular, its easy to find something that fits your lifestyle, and carry a bag of some sort without attracting attention. Essentials here would be a bottle of water, a couple snacks or energy bars, an emergency blanket of collapsible jacket and a small survival kit such as an Altoids kit or similar. The greatest problem here? The mental block guys have regarding carrying a bag with them at all times. Women carry purses practically every single day, parents simply can’t go out without a diaper bag. At first I had to force myself logically to take it with me at all times. After a few weeks I just couldn’t go out without it. Maybe one of the most useful things in my bag from the everyday perspective is the extra empty space. I keep about half of it free. This way I can toss in it whatever I’m carrying or buying that day and avoid the nasty little plastic bags that would end up in the trash anyway. Just like flashlights need batteries, the rest of your gear will need proper care as well. The difference between poor and quality craftsmanship is not that one breaks and the other one doesn’t. Everything wears out and eventually fails, the difference is that with quality gear it takes longer and you generally get a bit of warning. Check your gear often and do proper maintenance. As we say around here, if your gun isn’t showing wear, your just not using it enough. Know how to disassemble your firearm, know how to repair it and keep a spare part kit, even with Glocks. Usually a few pins and springs, firing pin extractor and ejector, back plate and that little white plastic piece that jumps out when you remove the back plate. When it comes to knives, you just have to know how to sharpen them and clean them after use. It doesn’t matter if you get one that costs hundreds of dollars or is ridiculously hardened steel like you see sometimes (+60rc) It will just be harder to sharpen later on, that’s why I prefer knives that are around 58/59rc. There’s people out there that send their knives to be sharpened to a specialist. Would you be doing that during an emergency? No, you have to know how to do these things yourself. Same thing goes for your multitool. It must be kept sharpened and oiled at the pivot points so as to be in proper working condition when you need it. The Leatherman Charge and Wave which I use and always recommend uses a number 10 security torx screw. Get a set of safety torxs screwdrivers that includes the number 10 so as to tighten or loosen your Leatherman or disassemble if needed. After using your knife for working or eating, clean it before putting it away. I use the knife that I carry in my pack for “asados” (Argentine version f BBQ) After eating I’ll clean it with a napkin and store it in its sheath. The grease left protects it from rust but it may leave a few stains because of the fatty acids. Since this is not a showcase piece, I can live with that. Sometimes when training or after simply getting caught in the rain, all your gear gets wet along with you. What I do is right as soon as I get home I spray everything with WD40. (great stuff, have several cans handy) WD, stands for water displacement, 40th attempt. This was created specially to keep water away and avoid corrosion. It has been used to keep away humidity from submarine batteries and avoid corrosion in Atlas missiles. Victorinox’s manual says to open and close the tool while submerged in hot water. This removes grit and dirt. Afterwards dry and oil. Just a few thoughts guys, take care and enjoy the rest of your weekend! Food Price Inflation. 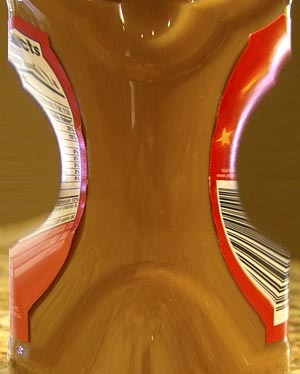 How long can food companies continue to hide inflation using their food packaging schemes? It seems to us, at least where we live, that not only are food prices in general continuing to creep higher, but the packaging is cleverly getting smaller. It’s almost like the reverse of how you don’t seem to notice your child growing bigger and taller, because it happens so slowly. Then one day, you suddenly notice how junior has grown. Well, conversely, junior is shrinking when it comes to food packaging. Every once in a while, when grocery shopping, you pick up that package of xyz and you say to yourself, this box seems smaller than before! The other day while shopping, I had noticed a brand of peanut butter that I had not seen displayed in a long time. Since I remember that I liked the taste of that brand years ago, I decided to splurge and buy it to see if it still held up to my recollection. I remarked to my wife how the price seemed not bad… until I picked it up and realized that the jar was smaller than it should be for that typical size-range that we were used to. I instantly could “tell” that the diameter of the jar was smaller than before. Now, not only are there all sorts of odd sized packaging, but now you commonly see decimals! What is the sense of 14.3 ounces? The answer is, it makes sense to the bean counters at the food corporation to increase their profit margin, or to keep up with their own increased costs of production! Most likely that product used to be in a 16 ounce package. Packages are getting smaller and smaller. Now lets do the math. Lets say that product xyz is priced $3.00, same as it was 4 months ago. However instead of being packaged in a 16 ounce container, now it is only 14.3 ounces. Some people may not even notice the small change in weight because of the clever way that the container and label are redesigned to “appear” that it hasn’t changed. Clever corporate marketing. Well, that difference in weight (1.7 ounces) equals a 10 percent food price increase! Even with only a 1 ounce reduction of a 16 ounce package equals a 6 percent food price increase! This is a major way in which food companies have been hiding food price inflation. Now, not only are the packages getting smaller, but they are raising food prices. That $3.00 xyz product not only went up 10 percent because of a downsized package, but they raised the price to $3.29, an 8 percent increase! Between the packaging change and the price increase, the food price has gone up 18 percent! Another way of saying this is that the purchasing power of your dollar has decreased by 18 percent. Now that we see what is happening with food prices, what is the best thing we can do? Answer: Be aware of the corporate schemes and buy more food now, rather than later, because this will not stop. The current economic mess and massive debt load of the USA and many other countries of the world is resulting in a purposeful faster devaluation of the currency. Without getting into the details of that, suffice it to say that inflation is here, and is going to get much worse in the future. Stock up on food now. It makes financial sense. It makes preparedness sense. One danger I worry about with regards to foods and corporate optimization, are the substitutions that are put in food products in place of “real” food substances. We know it’s happening, and despite what the FDA says, it can’t be good. But that is for another post. Most of us are used to seeing the “tags” on the grocery store shelves with the food, the ones that sometimes show price per unit. I say “most of us” and “sometimes” because it is not always the case. Evidently laws vary from state to state and certainly from country to country. All you can do is the best you can, try to determine the price per unit to compare and find a best deal. Having said that, I have seen tags that indicate price per ounce (I like that) while others indicate price per serving (I do not like that), and still others do not indicate a price per unit at all (I definitely don’t like that). Foods priced on servings vary wildly and require a calculator to figure it all out at the grocery store – how annoying. Soon enough, peanut butter will be sold in one-serving squeeze tubes instead of 18 ounce jugs, but will still cost you $3.00. That goes for the other food stuffs too (just using PB because it’s what set me off this weekend). "And Elisha said unto him, Take bow and arrows..."
Elisha I'm not, but I’ve previously written and posted a couple of articles on primitive weapons. The first article concentrated on pretty basic stuff like throwing sticks and such, the second on a more advanced ones, like the sling. This third one is about bows, which are likely at the top of the heap in non-gunpowder weapons. There are several good arguments for including some sort of bow in your planning. The first of which is that the bow is likely the most lethal of the non-firearm weapons. Using modern arrows tipped with razor-edged broad-heads traveling at a couple of hundred feet per second, you can count on penetration and killing damage if you hit the target properly. The second reason to choose a bow is range. Generally, you can place an accurate shot out to 40 or 50 yards without an unreasonable amount of practice, and an expert bowman might take a shot on a large target like an elk out to 70 yards, but as accurate arrow placement is critical in dropping big game, shorter is usually better. Still, the bow outranges everything else except firearms. Another reason to consider bows is the question of maintenance and ammunition re-supply. Generally, arrows can be recovered and reused without the need for additional equipment and supplies, unlike firearms. They are simple to maintain, and what parts you need are cheap and easily replaced by most people. This may not be strictly true in the case of some compound bows that require ‘tuning’. 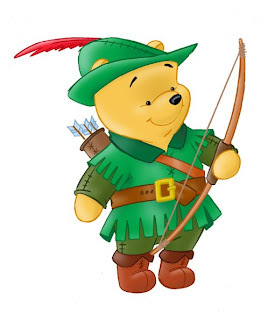 Still, the likelihood of you being able to maintain and repair your bow are far higher in my opinion than your chances of being able to maintain firearms and a supply of ammunition over the long term. Of course, even the most careful archer will lose or break arrows and strings or even the bow itself. The advantage the archer has is that with again a not unreasonable amount of practice and skill, he can manufacture ammunition, parts, or the whole weapon! Other advantages of bows include the near silence of operation and the low carrying weight of the weapon and ammunition. That said, taking a bow to a gun fight is usually bad news for the bowman. Despite their occasional use by special forces and guerillas, the likely defensive use for bows is limited to the occasional silent ambush. The more proper role for the bow in survival is as a supplement to firearms. As mentioned previously, ammunition will eventually run out if things are bad enough for long enough, and having a bow and some skill in its use will push the day when you fire your last bullet further into the future. There are three broad classes of bows to choose from. 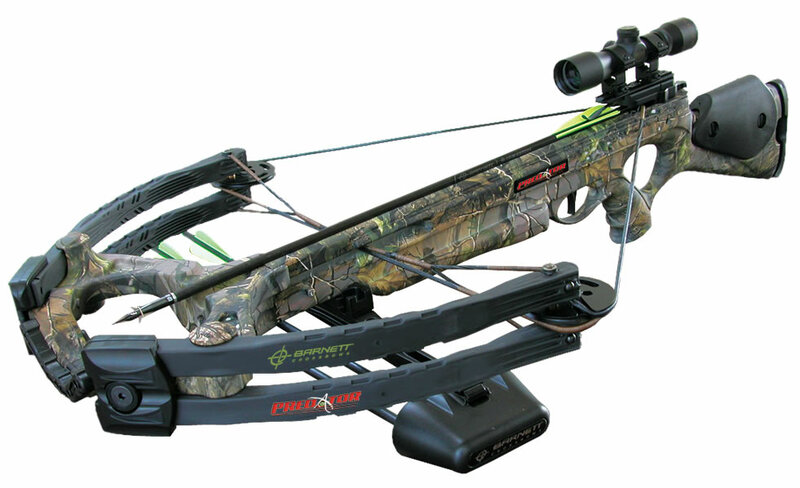 The first of these is the compound bow (see picture above). Using a system of eccentric pulleys, the compound bow allows for a ‘let-off’ of a certain proportion of the bow’s draw weight, making it easier to wield a more powerful bow with less effort. They tend to shoot arrows in a flat, fast trajectory, and are a popular choice. 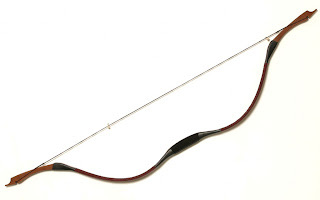 The second type of bow is the ‘simple’ bow, either re-curved or longbow style (A re-curve is pictured here). Simpler in construction, they require more skill to use, but generally are lighter than a compound bow and easier to maintain. Essentially having only two components (the stave and the bowstring), they are deceptively simple in structure. This type of bow is also the ‘easiest’ to manufacture from available materials. If I was choosing between these two types my choice would be the traditional bow over the compound, but I’ve shot and enjoyed both. A third type of bow you might want to consider is the crossbow. The crossbow has two main advantages. The first is that the draw weight is far higher than with the other two bows, giving the bolts (not arrows!) a lot more kinetic energy upon release. The second is that it most often has a rifle style stock and trigger, and is sighted much like a rifle, so the transition from rifle to crossbow may be easier for some people. It also retains most of the simplicity of the traditional bow, and both crossbow and the ammunition for it can also be built from scratch. The downside is that due to its high draw weight, the crossbow is more difficult to reset, which leads to a slower rate of fire. It also tends to weigh more than traditional bows, and that combined with the difficulty of cocking it may make the crossbow a less than ideal choice for people of smaller stature. Additionally, it can be somewwhat more complicated mechanically, although this depends on the maker. Finally a word about the ammunition for bows, whether arrows or crossbow bolts. There are many different types available. There is of course the traditional razor edged broad-head, which will do fearful damage to any living thing hit solidly. Additionally, there are ‘blunts’ for hunting birds or other small game, as well as arrows designed for fishing, complete with attached fishing line. These tips are usually interchangeable, and make the bow a very useful and versatile weapon. Giving pills to cats and dogs. Prepper find of the week!